We cordially invite you to the Lane Cove Cats 2019 Soiree. This year we have decided to move our annual soiree to the start of the season. The aim is to get everyone together early in the year, in particular the new families to the club, and celebrate what is ahead for everyone involved with the club. And we are in no doubt that we are inline for another great season at the Lane Cove Cats. We are excited about the re-development of the lower turf field at Blackman Park. With a completely new surface and re-aligned to create a 160m long field, we are able to run games for older age groups all day Sunday. We recently announced we would be be calling this field the Steve Chisholm Oval, after the founder of our club. 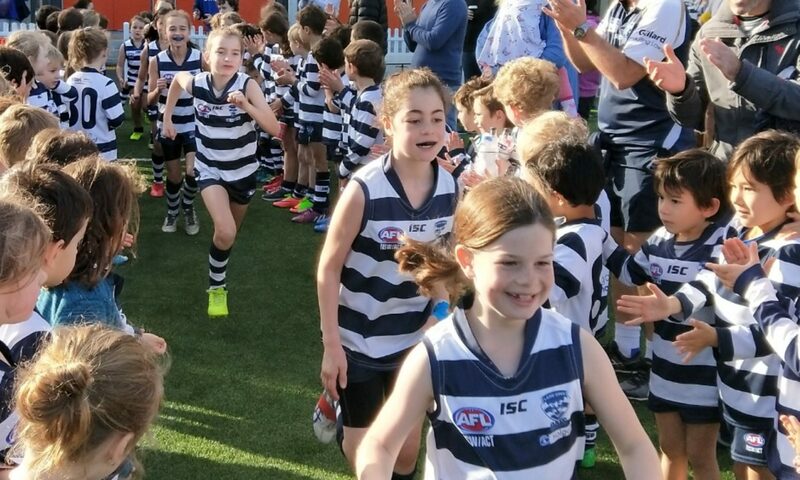 The Auskick program has gone from strength to strength, run by the Auskick Coordinator of the Year (Sydney North) Peter Beck. We also entered three teams in an Under 8 competition. In the junior division, we are entering a new era, with the club joining forces with the North Ryde Dockers in a number of joint venture teams. Under this new strategy, we will have a much better chance of providing a club environment that caters to all age groups and skill sets the school years. We also continued to expand our youth girls division, with the club enter a team in the first ever under 14 division. This adds to teams in the U10 and U12 age groups. The rest of the junior teams have gone from strength to strength. Encouraging for the future was the creation of three teams in the U9 age group. Overall we are on track to increase our total numbers by at least 20% this season. We are also planning our third edition of the Sports Legends Lunch. This is now firmly entrenched as our main fundraising event for the club. Last year it raised over $12,000 and help fund new equipment and the recruitment of assistant coaches and a ground manager for 2019. The night will include an AFL trivia quiz, which is sure to provide plenty of fun on the evening, Delicious finger food will be provided, while a private bar will be available to purchase drinks. We are lucky to have Zac Langdon visiting the club this week. He’ll be on hand to help out with some drills at Wednesday’s youth girls training session, before hanging around to have a chat and sign some autographs. Mature-age forward Zac Langdon has been a revolution for the Giants. He was selected at pick 56 in last year’s NAB AFL Draft and made his AFL debut in round one, kicking three goals in his first two games. 24 & 31 March: Practice and trial games, 8:00-12:00 @ Blackman Park 08:00-12:00. The Lane Cove Cats Junior AFL Club (LCCJAC) Annual General Meeting is being held 7.00 pm Friday 2nd November 2018 at Longueville Sporting Club (The Diddy). Nominations for committee positions are now being sought and to assist in the orderly proceeding of the meeting are recommended to be lodged with secretary@lanecovecats.com by 10PM Thursday 1 November 2018. Verbal nominations at the meeting will also be required. Any Member wanting more information about the roles and responsibilities of any of these positions are asked to contact Daniel Hynes at president@lanecovecats.com or Michael secretary@lanecovecats.com. The 2018 Committee encourages members from all age groups to consider committee involvement. Introduction of new talent to the committee ensures the Club continues to be relevant to its current membership, brings new ideas and allows prudent succession planning and knowledge transfer as longer serving members retire. Minutes of last Annual General Meeting. All committee positions are declared vacant. Nominations to be called for other committee positions and general committee positions in accordance with the club constitution. Registrations have now commenced for this year’s AFLJ 7s series tournament. If you didn’t play last year, AFLJ 7s is a fast paced, low impact version of the game. It will be played on a small sized oval and involve only 7 players on the field. Each team can also have up to three reserves. Games will be played on the synthetic field at Blackman Park on Monday afternoons between 4-6:30pm, starting on 5 November. There will be three regular rounds, before teams play off in finals on the 26 November. We are planning to run several divisions so that kids can play against similar aged opponents. This will include youth girls divisions. Registration costs $25 per player, which helps us cover ground and umpire fees. We will also have a free BBQ on finals night. We will be holding our team presentations this Sunday 9 September at the Longueville Sporting Club (The Diddy). Proceedings will commence at 11:00am. All team awards (best & fairest, coaches award etc) will be presented on the day, plus a few club awards. The Diddy’s kitchen will be open for lunch, and probably have a few fun games of footy on the green. We plan to be all wrapped up by 1:30pm. We would ask that all players bring their Lane Cove Cats guernsey and shorts, preferably washed and in a bag labelled with your name. If your son or daughter has also grown out of their footy boots, also bring them along. We plan to donate all boots collected to disadvantages members of the community via registered charities. It was another succesfull edition of the Sports Legends Lunch last Friday. A full room enjoyed some great conversation as Amanda, Mick and Jude discussed everything from new rule changes to the most annoying player they have come across. But more importantly, we ended up raising nearly $10,000 for our club. These funds will go stratight back into the club, into projects such as Blackman Park B4 upgrade and a new electronic scoreboard. A big thank you goes to the organising committee of Matt Cunneen, Amanda Webb and Daniel Hynes. We are already planning a bigger and better event for 2019.